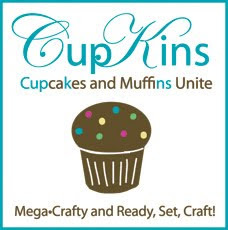 Cupkins- is a collaboration between Joanne from Ready, Set, Craft! and I. Each month we pick a theme and make a cupcake or muffin that follows that theme. Now that it's getting warm here in the northern parts of the country it's almost time for fresh picked berries! (Yum!!) So for May Joanne and I chose Strawberries as our theme. Strawberry picking always reminds me of my grandmother. She loved growing berries herself but she also always went to a u-pick farm to get flat of berries enough for tons of pies and jams. The other thing I always think about is the Rhubarb that she grew. I would never eat it as a kid- or really an adult. 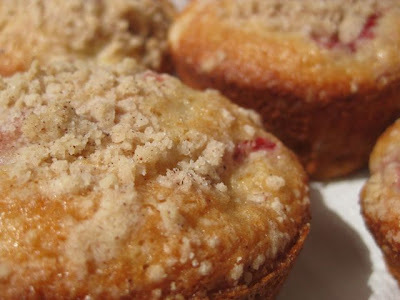 In fact before I made these muffins I'd only ever eaten Rhubarb once before. Despite never eating it I've always remembered the big red stalks that would come up on the edge of her garden ever year. 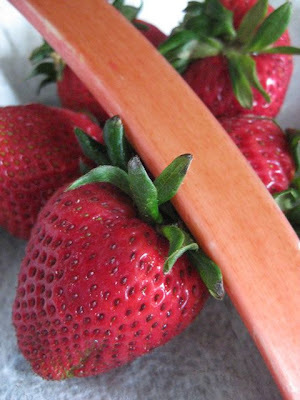 And as it turns out I really enjoyed the Rhubarb! 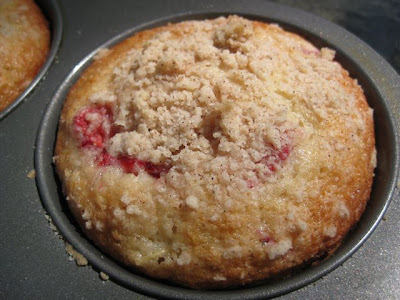 This has become my favorite strawberry muffin recipes- from now on rhubarb is definitely going to be seen more frequently in this house. First add all the dry ingredients to a mixing bowl. Then add the applesauce, milk, egg, oil and stir just until combined. Don't over-mix or the batter will get chewy. 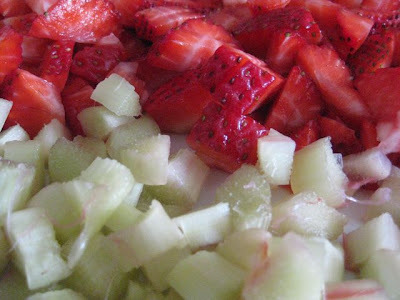 Now add the berries and the rhubarb and mix until incorporated. 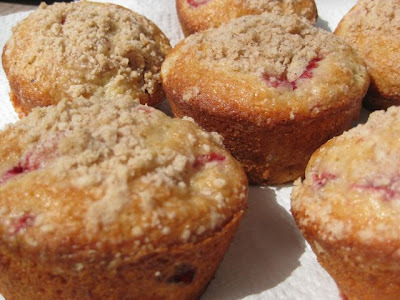 At this point you can spoon the batter equally into muffin tins. I grease mine with non-stick spray but you can use liners if you like. This will make 6 large muffins, 12 standard size or 25 minis. I have to admit I did this more by eye and less by measurements. 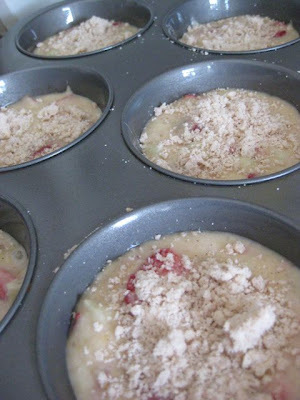 I estimated the amounts below but if you're comfortable with "winging it" on the crumble topping and want something really exact there are lots of basic recipes online. Put all these ingredients into a small mixing bowl. 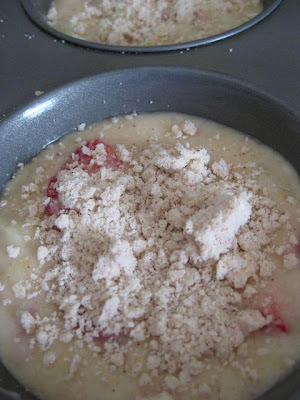 Use your fingers or a fork (I think you're fingers work the best though) and mix until crumbles form. Generously sprinkle this on top of each uncooked muffin before placing them into the oven. 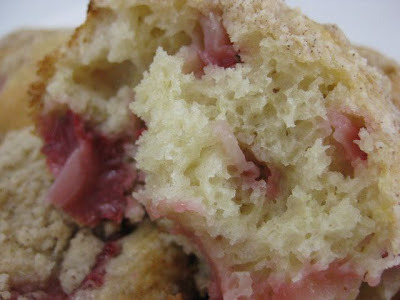 Bake muffins at 375 until toothpick inserted into the center comes out clean. For large muffins mine usually take between 18 and 21 minutes. These took 20 minutes. Now head on over to Joanne's blog (by clicking the Cupkins logo below) to see the delicious Strawberry themed cupcake she's come up with. 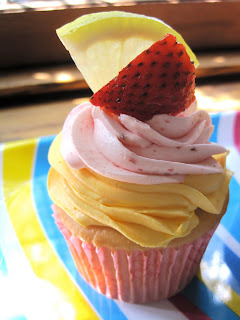 I had a bit of a sneak peak this month.... and I love how these Strawberry Lemonade Cupcakes sound... yup that's right I said Strawberry Lemonade, perfect for summer! Seriously Isn't that the yummiest looking thing! Linking to you guys today on foodwhirl. I've never tried rhubarb in muffins... sounds like something I should try! Those look YUMMY, Meg! Your stuff always does! And I'm loving our little feature over on Foodwhirl today - yeah!